Children With Autism Have a Camp of Their Own | Camps | Kids VT - small people, big ideas! Summer, for many families, means carefree time spent together, often outdoors. But New Hampshire dad Rob Sylvan says that typical seasonal activities haven't always been easy for his clan. That's because his 13-year-old son, Quinn, has an autism spectrum disorder. When Quinn was younger, "something as simple as going to the beach was a real challenge," Sylvan says, because his son wanted to touch every towel on the sand. Other beachgoers, who couldn't see Quinn's developmental disability, would glare at both him and his parents. "It looks like you have a kid who's not behaving," Sylvan explains. This past June, though, Quinn and his dad enjoyed some carefree summer fun at Camp Kaleidoscope. 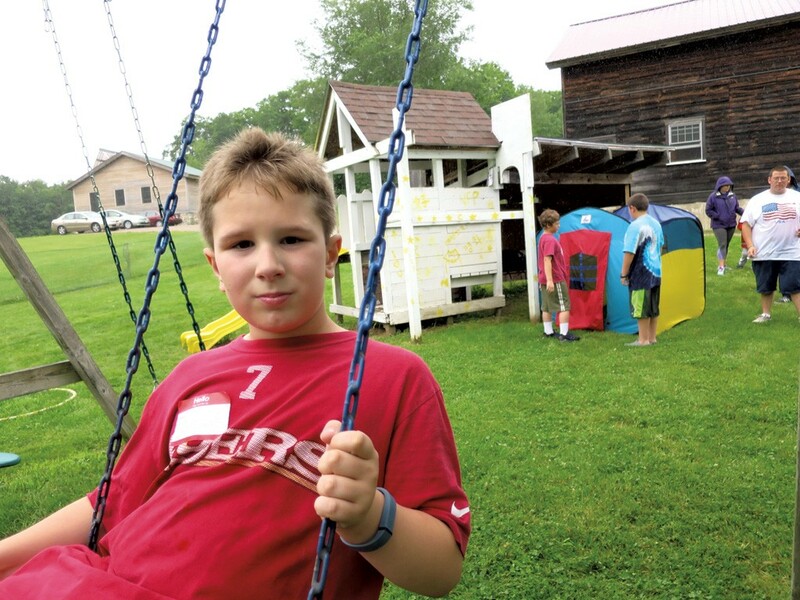 The annual four-day family camp at the Common Ground Center in Starksboro, is designed specifically for kids with autism and their families. There, campers can relax and swim, do archery, play tennis, run through meadows and zoom down a Slip'N Slide in a safe, supportive, judgment-free environment. After coming to Kaleidoscope five years in a row, tall, dark-haired Quinn is familiar with the other families, and he's gained independence. Today, he is calmer and less impulsive, his dad says. Quinn likes to socialize, but in his own way — he might respond to questions with just one or two words. And he still makes sense of the world through touch. His dad says, "If he sees a snake, he wants to touch it and pick it up." At Camp Kaleidoscope, no one asks why. The camp, which sits on 700 acres in the foothills of the Green Mountains, is open to children with autism, their siblings and parents. At the end of June, 31 kids and their families took part. The nonprofit Common Ground Center where the camp is held hosts an eclectic range of gatherings: weddings, yoga retreats, Camp Outright for LGBT teens and allies, camps for divorced parents in conflict, and family camps for parents and kids. Camp Kaleidoscope uses the same facilities, with a few modifications. Autism spectrum disorders "can cause significant social, communication and behavioral challenges," according to the Centers for Disease Control and Prevention (CDC). Managing those challenges are paid staff who work with autistic children during the school year. College students studying speech language pathology also help out for credit or experience, offering one-on-one supervision to campers who need it. 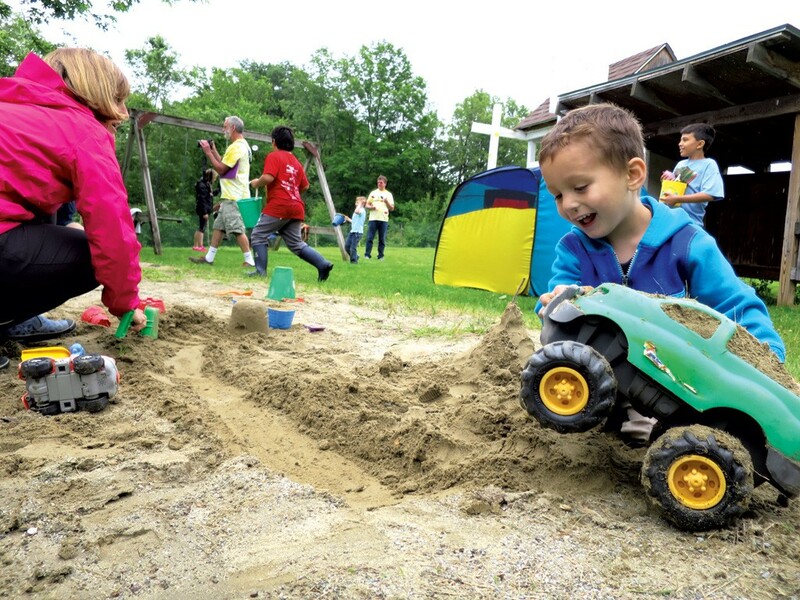 On a humid summer morning during this year's session, a converted horse barn was set up with various play options: arts and crafts, Legos, a gooey Oobleck station and, just outside the door, a playground and sandboxes. Temporary fencing encircled the barn so that staffers would have time to reach any child who might try to run off. 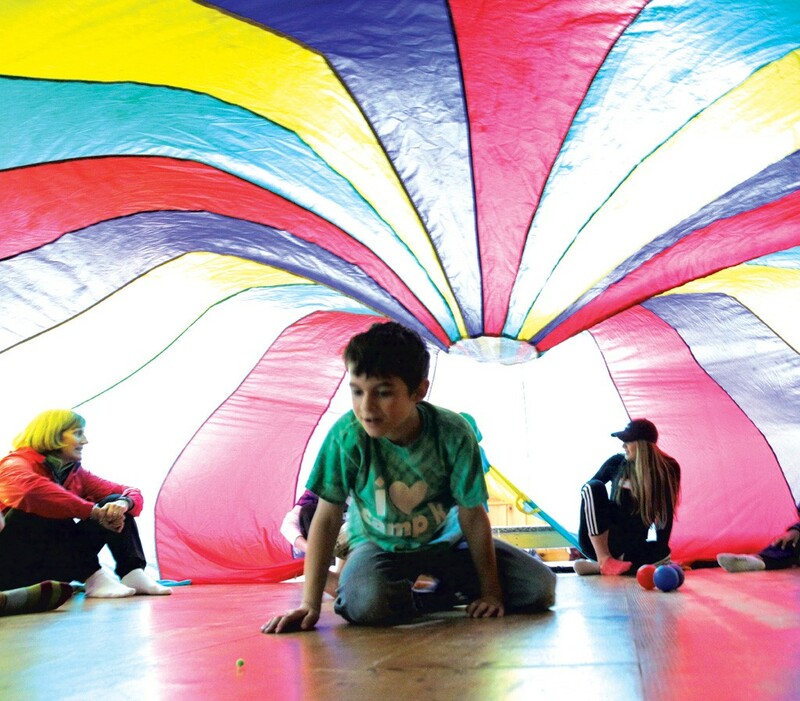 "Bolting's an issue," explained Margaret Novotny, a speech language pathologist who helps run Camp Kaleidoscope and has worked with autistic children for many years. She said safety measures such as the fencing allow children to roam from activity to activity. "You try and stop something before it happens," she said. "So they can have a lot of play and creativity without us having to say no." In the morning, kids go off to supervised activities while their parents linger over coffee or hike mountain trails. After lunch, families spend time together trying out different sports, games and crafts with the help of staff. That morning, kids played on the swings, painted with shaving cream and mused about what they would perform at the talent show that night. The relaxed performance brings some parents to tears every year — their children with autism don't typically participate in school concerts and plays. Autism spectrum disorders (ASDs) are on the rise in the U.S. CDC data from 2010 show that one in 68 U.S. children are on the spectrum. That number has increased steadily since 2002, when one in 150 children met the criteria. Part of the increase might be due to an uptick in diagnoses and a broader definition of what constitutes ASD. Increased prevalence is also a possible factor, according to the CDC. Some children experience mild impairment, others severe. The impact on family life can be profound. Families often have to scout outing destinations in advance, even if they're only going to the grocery store. "Some of these families haven't been able to take a vacation for 10 years," said Camp Kaleidoscope founder Jim Mendell. He established the Common Ground Center with his wife, Peg Kamens, and purchased the property, a former horse farm, in 1998. Before that, it operated as the Tatro family dairy farm for more than a hundred years. It encompasses forest, fields and dramatic rock outcroppings. Tatro Road climbs past a swimming pond to the Hogback Mountains. Mendell grew up attending Camp Killooleet in Hancock and always enjoyed the last week, when parents were invited to stay over for a few nights with the kids. 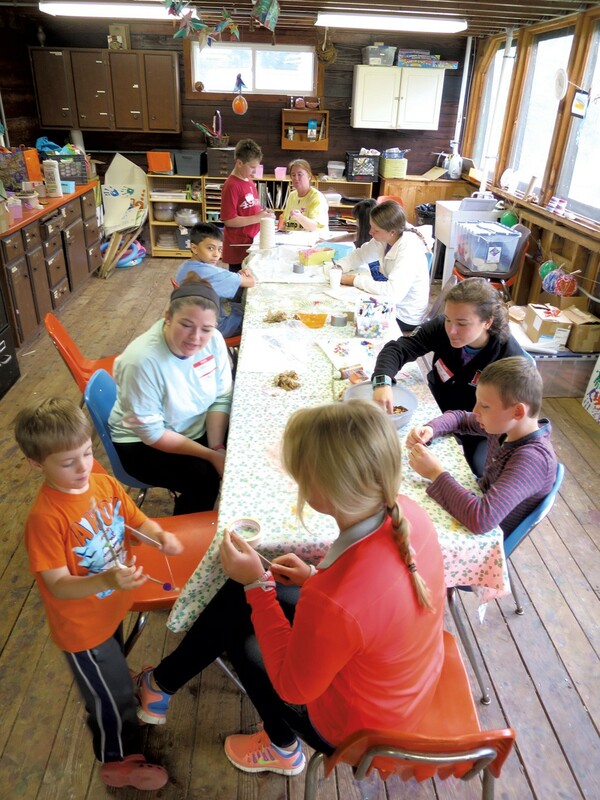 He created the Common Ground Center to host family camps and gradually expanded to offer other programming. He added Camp Kaleidoscope to the list nine years ago, after several parents with autistic children had expressed interest in family camp. It became clear that the typical camp format wouldn't work for them, so Mendell reached out to organizations that specialize in services for children with autism, and veterans in the field like Margaret Novotny. They helped create Camp Kaleidoscope, a place where children are safe and free to explore, and where staff and interns understand the particular challenges that autism presents. Changes in routine, for example, can be unsettling to autistic children, even at an accommodating place like Camp Kaleidoscope. One of this year's families left the camp a day early, exhausted and harried after a sleepless night with their child, who had trouble adjusting to the mostly vegetarian menu at camp. The family's exit elicited friendly good-byes and nods of understanding from other parents whose children were able to handle the new experience, at least this time. One of the best aspects of the camp is being around other parents who have walked in the same shoes, said Nina Nsilo-Swai as she visited with a reporter one morning during the June camp session. "It's good to be with people that get it," she said. She and her husband, Mark LaRocca, have come to Camp Kaleidoscope from their New Jersey home for the past three summers with their son Kibo, who has autism, and his younger brother, who does not. She runs a business from home and LaRocca works at an advertising agency in New York. At camp they slept in a cabin with no electricity, unplugged from computers and phones, and went to bed with the setting sun. In the rough-hewn, solar-powered dining hall, they ate fresh soups, casseroles, tangy salad greens and other vegetables grown at local operations including Footprint Farm right up the road. On this morning, the sounds of birdsong and water running through Lewis Creek mingled with the voices of children, and parents chatting and exchanging ideas. Kibo's parents talked about their sports-loving son with another parent, who had set up swimming lessons back home specially tailored for his autistic child. This opportunity to share resources is one of the things parents said they like about the camp. Once school lets out, it's not easy to find engaging activities for children with autism, parents said. This void can be challenging for energetic kids such as Kibo, as well as their parents. "From the time that he's up, you're on," said Nsilo-Swai. The great thing about Camp Kaleidoscope is "having the down time, being in a community where you feel comfortable and free and nothing that your child does would raise an eyebrow," she said. Kids with autism and their siblings who do not have autism do activities together. They all make friends, sometimes without knowing who is on the spectrum and who isn't. Nsilo-Swai has found Camp Kaleidoscope to be a good experience for both her sons. Siblings of children with autism learn to be patient, she said. "They have a lot of empathy, I think." There are other camps for youngsters with autism and related special needs around the region, but the list is short. In almost a decade of operation, Camp Kaleidoscope has developed a solid following and strong bond with families, mostly through word of mouth among parents and recommendations from advocacy groups around the Northeast. Grants help fund scholarships; cost per family ranges from $250 to $500 on an income-based sliding scale. This year, to accommodate kids too old for the regular program for ages 3 to 11, the camp offered a pilot program for teens during the same week as the regular Camp Kaleidoscope. Four teenagers, including Quinn Sylvan, took part. They slept in their own bunkhouse — which for some was their first overnight away from their parents, who tented or stayed in cabins on the property. Quinn made pizza with the other campers and had no trouble falling asleep — to his dad's relief. Sylvan said it was exciting to see his son growing up toward what he hopes will be a happy adulthood. The teen program went so well this year that it might expand next summer. "As the kids get older, they need to become more independent from their parents if they are going to go out on their own at all," Mendell said. "So this is a really great step forward for them to do that." Vermont has at least 789 people under the age of 21 who have been diagnosed with autism spectrum disorder, according to the latest numbers from the state Department of Health. The causes of autism are not fully understood. A combination of genetic, biological and environmental factors is likely at play, according to the CDC, which is a clearinghouse for the many studies conducted on the disorder. These have not fully answered emerging questions such as why boys are five times more likely than girls to have ASD and why children of older parents are more likely to be on the spectrum.